Lord tonight I need a friend. 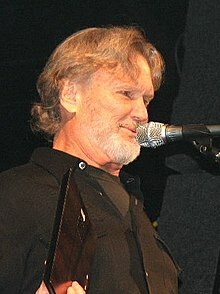 Kristoffer "Kris" Kristofferson (born 22 June 1936) is an American writer, singer-songwriter, actor, and musician. All songs written by Kris Kristofferson except as noted. Freedom's just another word for nothing left to lose..
And nothing ain't worth nothing but it's free..
And found my cleanest dirty shirt..
Comin' close together with a feelin' that I've never known before, in my time. She ain't ashamed to be a woman, or afraid to be a friend. I don't know the answer to the easy way she opened every door in my mind. But dreamin' was as easy as believin' it was never gonna end. And lovin' her was easier than anything I'll ever do again. That was worth loving you or the kindness you've shown? At a tavern called the Sabre and the Rose.. This page was last edited on 24 August 2018, at 13:41.